Like all right-thinking people, I’m a gigantic fan of Key & Peele. If you’re reading this, the odds are that you are too. It’s possible, though, that maybe you aren’t familiar with their stuff. If so, that’s okay! I try to be mindful that not everyone comes to the same material at the same time. * Good art has a way of coming to people when they’re ready for it. Created by Keegan-Michael Key and Jordan Peele, their sketch comedy show ran on Comedy Central from 2012 to 2015. Beyond getting truly goofy, Key and Peele genuinely had something to say, and they made their points with wit and style. Give a couple of episodes a watch, and you’ll notice patterns. A fondness for moments of surrealism. Razor sharp takes on race in America. Jordan Peele in particular adores horror. Many of their sketches either make fun of horror or have disturbing undercurrents that a lesser show like Saturday Night Live is too timid to attempt. Take a look at their “Marbles” sketch** and you’ll see a piece that flirts with psychological horror while still being funny as hell. Now that Peele is an Academy Award-winning filmmaker, he’s leaning more in the direction of horror, the dark mirror image of comedy. The irony is that when Get Out was released in 2017, many filmgoers who would ordinarily sneer at a scary movie fell all over themselves to praise it as “elevated horror” or a “psychological thriller” or nonsense like that. 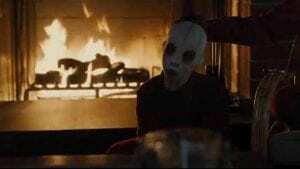 I suspect Peele noticed that reaction, because there’s no mistaking his newest film Us as anything but a horror movie. During a summer night in 1986, a young girl wanders along a Santa Cruz boardwalk. This is Adelaide (Madison Curry), and while she doesn’t say much, we can sense she doesn’t miss much. Her father Russel (Yahya Abdul-Mateen II) drains a beer a little too fast and searches for another. Her mother Rayne (Anna Diop) frowns, probably not for the first time. Adelaide becomes separated from them, and she stumbles upon what looks like an abandoned funhouse. Inside, something awful happens. Time passes to the present. Adelaide is a grown woman, now played by Lupita Nyong’o. She’s married to lovable lunkhead Gabe (Winston Duke), and their children are Zora (Shahadi Wright Joseph) and Jason (Evan Alex). This is the Wilson family, and they are returning to their vacation home. It’s a peaceful house, located not far from Santa Cruz. The plan is to spend the weekend hanging out at the beach with their friends Kitty (Elizabeth Moss) and Josh (Tim Heidecker). Adelaide does not love this plan, and she really doesn’t love being back. Seeing a string of odd coincidences and a homeless man with a bleeding hand and a sign reading “Jeremiah 11:11”*** doesn’t help. Gabe thinks she’s overreacting. Thanks for that, Gabe. That evening, the family is preparing for bed. They are disturbed, and not for the last time, by something truly bizarre. A family of four stands outside in the darkness. All of them wear red jumpsuits. All of them carry golden scissors that are preternaturally sharp. Only one of them can speak. They are exact doppelgängers of the Wilson family, and they have arrived to wipe them out. They will not stop. Look, if it were up to me, I’d give you guys one of the shortest reviews in the history of film criticism. I’d tell you to see Us, then see it again. But my editor and the owner of this fine website expects more from me than that, plus I don’t want to get the hose again. Further talk of the plot would be unforgivable, so let’s move on. There are some filmmakers out there that, when you see their films, you’ll know within a few minutes that only they could have directed this movie this way. That’s the case for Spike Lee, David Fincher, and Martin Scorsese. We can say the same thing about Jordan Peele. I’m gobsmacked that this is his second feature film since it’s directed with astonishing confidence. Along with cinematographer Mike Gioulakis, he’s made a film with deep and rich colors shot within eye-catching locations. Beyond being pretty, Peele’s pacing is brilliant. He allows scenes to run as long as necessary in order to crank up tension just so. 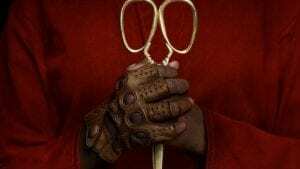 Horror and comedy both depend on flawless timing, and Peele knows when to relax and let us hang with the Wilsons, when to inject quiet dread, and when to let the narrative go flat-out. Peele’s film only functions properly with the right cast, and he’s got just the right actors here. As sweet doofus Gabe, Winston Duke just destroys playing a lame but goodhearted dad. Elizabeth Moss and Tim Heidecker have spiky chemistry as the Tylers. This is ultimately Lupita Nyong’o’s film, and she’s extraordinary, particularly so when she’s in scenes playing Adelaide and her doppelgänger. Both characters she plays move and speak distinctively, and a scene where they do battle has a weird, balletic energy. This is an Oscar-caliber performance, and I’m hoping Nyong’o isn’t ignored the same way Toni Collette was for Hereditary. Right now I wish you and I could sit down over coffee or a good scotch and talk about Us. Has he made a film as strong as Get Out? I’m not sure. It’s definitely a weirder movie that’s exploding with ideas, perhaps too much, but I’ll need to see it a few more times and mull it over. 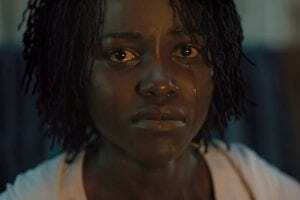 What I know for sure is that Jordan Peele is a cinematic force to be reckoned with, and I’m fascinated to see what he does next. *Just now, I’m making my way through the first season of Brooklyn Nine-Nine, only six years behind everybody else. **Which you can watch here. ****A good rule of thumb while watching Us: don’t lock onto the plot and meanings too much; focus on the emotion instead. We’re going to be thinkpieced to death with this film, particularly articles “explaining” what it all means. There isn’t a single correct interpretation here. Just trust your gut.